The North Carolina Community Foundation and our affiliate, the Currituck-Dare Community Foundation, recently had the opportunity to help sponsor the Hatteras Marlin Club Tournament in Hatteras, thanks to an invitation by a 2nd generation fundholder. Jennifer, Cherry and I hopped in the car, and off we went. Road trips are a norm in our line of work, with NCCF serving our great state – we are on the highway a lot. We talked about many things during our time on Hwy 12 -- mostly about how beautiful this part of NC is and how sacred and threatened the island is from Mother Nature. Hatteras Island has been on my mind a lot since Hurricane Matthew, and our first round of grants to the Food Pantry and the Methodist Men. Our day at the HMC Tournament was time well spent; we saw many friends and met new ones. Some knew our staff across the state and some had not heard of us. It was a joy to explain our work and our role in the state and in our small and large communities. You see, we have an important job here at the Foundation. We are not just a grantmaking organization. We also serve as a resource in the counties by offering ways that individuals and organizations can create permanent endowments to forever benefit the communities and causes they love. Since I live in Elizabeth City, which is about as far northeast as you can get, I can see first-hand how endowments can save a community. Endowments allow our fundholders and affiliates to make vital grants to help meet the needs of our communities, our cities, our counties, our regions and our state. Needs may vary from county to county but one thing is constant: needs are prevalent. This is what brings me to work every day. I get up and I realize that I have such important work to do. My job is to make sure people in the northeast know about how the NC Community Foundation and our affiliates are here to help individuals, families, businesses and organizations create endowments for their communities now and in perpetuity. We also rely on our fundholders and our affiliate leaders to be our ambassadors for their counties and our state. This special fundholder who invited us to come to Hatteras and share his families’ passion for fishing was an honor. It was his way of connecting NCCF to folks who are generous and charitable and people who love their communities just like he does. Can you imagine the footprint we might leave if we all shared that responsibility? 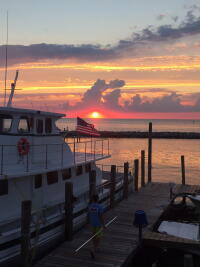 Pictured is the sunset from Jane Oden’s Breakwater Restaurant, a Currituck-Dare Community Foundation Board Member. Join me in a grateful heart for all that we have, and may we all work hard to give so generously.